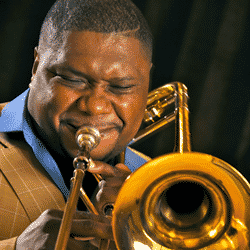 Born in Waynesboro, Georgia, Wycliffe Gordon found the trombone at age 12 and today is an 8-time winner of the Jazz Journalists Association Award for Trombonist of the Year. He was also recently awarded DownBeat Magazine’s Critics’ Choice Award for Best Trombone for the third year in a row. In addition to his always-memorable solo performances, he leads the Wycliffe Gordon Quartet, has been a featured guest artist on Billy Taylor’s “Jazz at The Kennedy Center” series, and is a former member of the Wynton Marsalis Septet. His performance experience includes work with Dizzy Gillespie, Lionel Hampton, Tommy Flanagan, Shirley Horn, Joe Henderson, Eric Reed, Randy Sandke and Branford Marsalis. He has released 17 solo and eight co-leader CDs. A committed music educator, Wycliffe is a founding faculty member of the Jazz Studies Program at The Juilliard School. He was the youngest member of the U.S. Statesmen of Jazz and a musical ambassador for the U.S. State Department. This is Wycliffe’s fourth year as an instructor at the Vail Jazz Workshop.